The process and product temperature is a very important physical indicator within almost every industrial manufacturing process. This applies for the solar industry, too. Infrared cameras of Optris used for industrial services are achieving higher importance within the solar industry due to new developments within the area of infrared sensing technology as well as reductions in price. Especially within the solar industry the production and monitoring of solar modules relies on numerous thermal processes. The compact and fast optris PI160 infrared camera of Optris is therefore often used for visualizing and monitoring the process. Temperature allocation of wafers for the production of solar modules is captured during string brazing. This assures a reliable and efficient assembling process. Temperature measurement takes place on the silicium surface which is connected to the braze point. That’s how the quality of the homogeneity of the brazing is measured. Challenges during the monitoring of the brazing processes are: the adequate local resolution and the temporally resolution as the heating of the braze points can take place in less than a second. With a resolution of 160x120 pixels as well as a frame rate of 120 Hz for the whole picture the optris PI infrared camera has developed into a suitable device. Both illustrations above show examples of an inductive braze process within the solar cell production. First, the solar cell is entering the braze area. Above the cell are two metal bands which are marked by the white arrow in the left illustration and which are going to be brazed with the cell. Afterwards the induction heating elements lower to the wire and press the wire onto the solar cell. Through creating an induction area the wire heats up and connects with the solar cells metal contacts. As shown bin the right illustration the heat energy process within the solar cell is seen quite clearly. At this stage it is important not to exceed a certain temperature in the silicium as the possibility of the wafer to splinter due to inner frictions remains very high. A further area of application for the optris PI160 thermal imager is the thermal monitoring of laminating processes after the single wafer has been brazed to a string. A process conduct based on thermal monitoring can provide consistent temperature allocations across the panel area during the heating and cooling down phase. Thereby the laminating process will be less stressful for the solar cells and the laminating film – the rate of defective goods can clearly be decreased. Contact free measuring infrared thermography is an essential instrument for the function control of solar cells. 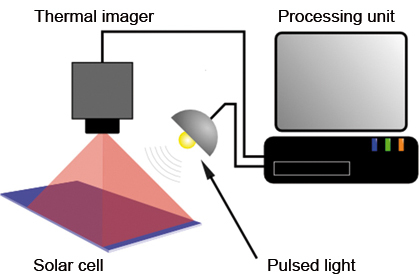 One possibility of the function control is the periodical modulated exposition of the solar cells with simultaneous observation with an infrared camera – the Illuminated Lock-In Thermography. The separation of charge generated through the exposure of light into the solar cell leads to leakage at defective parts. Those results in locally bordered heating of the cell can be detected with the optris PI160 thermal imager as a hot spot. The set up of the process is schematically shown in the following illustration. Another inspection method is the Dark Lock-In Thermography. The solar cell will be connected with the power supply unit and will than react with heat emission. The thermographical camera can support the localization of areas with low product quality by measuring the surface temperature. Modern thermal imagers are highlighted through an extremely compact construction form and a high image frame rate of 120 Hz. Therefore an easy integration of the established auditing method into the ongoing processes with concurrent testing times is feasible.